Photo of Jon Pritchett at the ground-breaking ceremony courtesy of Nextran. 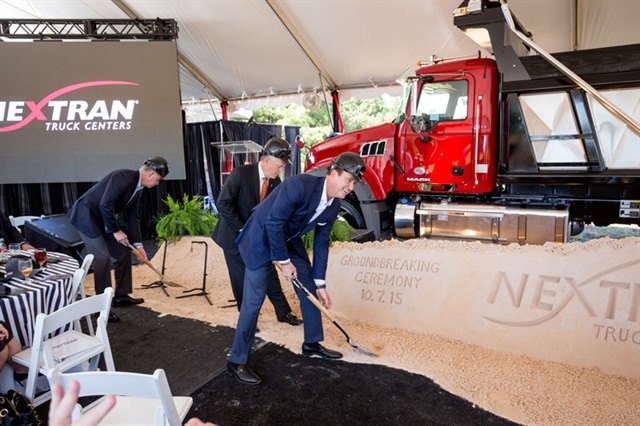 Nextran Corp., a commercial truck dealership and service provider, held a groundbreaking ceremony for its new regional facility in Atlanta that's set to open in the middle of 2016. It will be the company’s 15th location and include a service area for repairs to natural gas vehicles. The 55,000-square-foot facility will house sales and service functions, and focus on medium- and heavy-duty trucks. The service shop, a space of more than 120 linear feet, will feature an overhead crane spanning 112 feet. “We continue to expand the network of highly-reliable Nextran Truck Centers to serve our trucking industry customers who have the important responsibility of delivering essential products for America’s businesses and consumers. I’m proud of our hundreds of employees for building a company that represents quality, provides exceptional service and sells the world’s finest trucks,” said Jon Pritchett, Nextron's president and CEO.